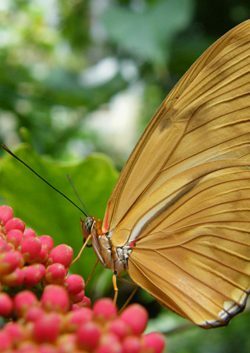 A relative of the longwing butterflies, the Julia, Dryas iulia, also has elongated wings and a slow, fluttering flight. You will typically see lots of these bright orange butterflies in the Center, because it is one of several species we raise on site. Males can be distinguished from females if you look closely: females have a rim of black on the wings, males are almost completely orange. In the Center you will often see pairs in courtship, the male fluttering for what seems like hours a few inches above a female, the latter usually perched with her wings spread open.